Peter Holden travelled to the 2016 USAFL Nationals and commentated women's matches throughout the tournament which were streamed live (and can be viewed on the USAFL's Youtube page). He also put together this week's Girls Play Footy Podcast featuring interviews over the weekend. The USA national side the Revolution have one of the most thorough selection processes of any nation ahead of the International cup. Over the past two years they have been assessing and trialling players from all over the USA. On Sunday the USAFL announced a narrowed squad of 66 players that will represent the USA. This time around they have announced they will select 30 players from this squad in April next year to bring to the 2017 AFL International Cup in Melbourne. Those named on Sunday that do not make the trip to Melbourne, will be then representing the USA in 2018 on a playing trip to Europe (details yet to be announced). It has been a very long time since the US national team has travelled to Europe (2001) after years of talk about it happening again it looks like it will get off the ground. The Revolution team will also take a team to Canada again in 2018. The Austin Crows are the USAFL National Champions for 2016 having beaten the Golden Gate Roos in the final of the USAFL National Championships. The Crows were out of the blocks early and had a strong lead at half time and looked to be certainties. Golden Gate continued to push them but in the end were no match for the Austin team. In Divison 2 the Calgary Kangaroos defeated the Columbus Jackaroos by 36 points and in Division 3 the Portland Steelheads were winners over the North Carolina Tigers by 24 points. Divison 4 title was taken out by the Ohio Valley River Rats combine. In the women's Division 1 the San Francisco Iron Maidens ended the Denver Lady Bulldogs run of titles and in Division 2 the Portland Sockeyes defeated the Montreal/Boston combine. In humid and variable conditions (bright sun to wind and rain) teams from across the US and Canada battled it out in four men’s and two women’s divisions. Reigning champions the Austin Crows kept their favourites tag as they accounted for the Quebec Saints and Denver Bulldogs in Division A with little fuss and with a win tomorrow morning over LA will be firm favourites for the title again. Greg Bridges plays for the Ottowa Swans and has made the Canadian Northwind Team to play in the 2017 International Cup. And now he has made a video about it. Check it out below or on Youtube. We look forward to following Greg's journey in this video blog series as he prepares for the tournament in Melbourne in August next year. See you in Melbourne Greg. The USAFL tonight announced that the 2017 National Championships will be held in San Diego, California. This will be the first time since Las Vegas hosted the tournament in 2006 that the Championships will be held on the western side of the nation and the first time in California since 2000. As this is written there are some concerns for the venue of this year's tournament, Sarasota, Florida (October 14-16 at the Premier Sports Campus). Hurricane Matthew is making it's way across the Caribbean Sea towards Florida and could possibly do some serious damage across the state and up the east coast if it lands there. Fortunately the tournament is not this weekend, but there could be on-going issues into next week that may affect travel and the host facilities. In the meantime we hope that all our friends on the US East coast stay safe and dry. Canadian rugby convert Mike Pyke recently appeared on the Fox Footy TV show Open Mike with Mike Sheahan. Sheahan took Pyke back through the details of his remarkable journey to success in AFL football. The audio of that interview is available below and is well worth a listen. Former Sydney Swans ruckman, Mike Pyke, will be the subject of this week’s episode of the Foxtel television show “Open Mike” hosted by veteran football journalist Mike Sheahan. The show will feature an in depth interview with the Canadian code-hopper who played 110 games for the Sydney Swans between 2009 and 2015, including being a member of the Sydney Swans 2012 premiership team. The 200cm former Swan also kicked 48 goals in his career with the club and stands as one of the best international recruits for any AFL club. His success has set the platform for others to come to Australia and try their luck. Matt Thompson from the www.afl.com.au website reports on life after the AFL for one of the recent American recruits to the AFL. The story certainly gives a small idea of how one player gave our game a shot and when things didn’t fully pan out, another career awaited. FORMER North Melbourne international rookie Eric Wallace has signed on with American NFL side Carolina Panthers. 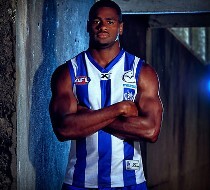 The North Carolina local spent three years on the Kangaroos list, but failed to play a senior game. Wallace – nicknamed 'The Beast' – has earned a spot on the Panthers 90-man roster in the position of tight end. Stanis Heili and Brandon Nazione have been selected to trial with a number of AFL clubs over the next week. 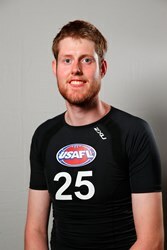 The two athletes performed well at the AFL's US Combine held in Los Angeles in April this year. They have already met with Mason Cox to personally discuss what may lie ahead for them and attended the St Kilda vs Melbourne game at Etihad on the weekend.